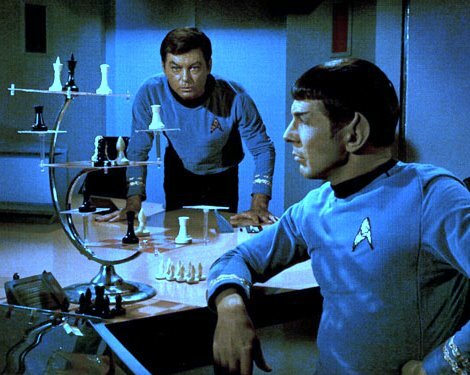 The Tri-D chessboard set was made popular by its inclusion in The Star Trek Star Fleet Technical Manual by Franz Joseph, who invented starting positions for the playing pieces and short additional rules. The complete Standard Rules of this game were originally developed in 1976 by Andrew Bartmess (with approval from Joseph), and he has subsequently expanded and fine-tuned them. There also is a Creative Commons-licensed manual written in Italian by Marco Bresciani, which presents a complete and faithful translation of the latest version of Bartmess’ Standard Rules, with instructions on how to build a chessboard and many other things. This manual is available through the Star Trek Italian Club (for members only, see external links, below). Marco Bresciani also made a software project as an Information Technology Laurea Degree final thesis, that allows playing Tri-D Chess with Bartmess’ Standard Rules full support. There are various computer applications for playing Tri-D Chess. A set of tournament rules for Tri-Dimensional Chess written by Jens Meder is available on his website, However, Meder’s rules are based on FIDE’s Rules more than Andrew Bartmess’s Standard Rules, with some deviations too. Isaac Asimov’s science fiction short story "A Perfect Fit" refers to a 3D chess game which is effectively eight chessboards stacked upon each other, making the playing area cubic (see also Cubic chess) rather than square (that is, exactly one dimension more than ordinary 2D chess). The same variant is also mentioned in Pebble in the Sky, during the early Galactic Imperial period on Earth. Roseate Formation : The King is surrounded by a ‘ring’ of Queens, and the Bishops etc, ending in a ring of Rooks. Both sides possess a ‘wall’ of pawns in the 2nd rank. This is the orthodox formation of Asimovian Hyperchess, and described in both novel and short story by the author. Type 1 : The King is central, with a ring of Queens, and then a ring of Bishops interspersed with Knights, a tertiary ring interspersed with bishops on diagonals, and ultimately Rooks interspersed with Knights at their tertiary move points (assuming a central quadrant L-movement). Viewed from the player’s perspective, there is an impression of nested crosses. Type 2: The King is central, surrounded by a ‘cross’ of queens interspersed with bishops, and then similar interspersed rings of Bishops + Knights, Knights + Rooks, and ending with a ring of Rooks. Viewed from the player’s perspective, there is an impression of a Maltese Cross. Type 3: The King is Central, and formation is identical to Type 3, except that at diagonal points in the Knight’s ring, a quartet of Queens are flanked by minor cruciforms of Bishops interspersed with knights. From the player’s perspective, there is a central cross with a quartet of mini-crosses, queen centered, near the corners of the ‘wall’. Asimovian Hyperchess is not easily played. Asimov himself imagined a chess set being quite compact, but even with standard boards and pieces it is highly unlikely that tracking pieces and their movements is easy. Mobility of pieces is the same as other three-dimensional chess forms, in that a pawn may move forward, and take a piece in the third dimension. The same rules apply to other pieces, and in Asimovian Hyperchess, Knights possess a remarkable ability, when acting in concert to permit a player to achieve a checkmate in less than 20 moves. For effective playing of the game, it is theorised that a chess display computer program would be of the most use, but that it is highly unlikely that a computer would be able to play Hyperchess efficiently, as move prediction more than 8 moves ahead is likely to tax even an IBM Bluegene Mainframe beyond its standard abilities. To date, Asimovian hyperchess has only had sporadic application, and there are few recorded instances of it being played. The movements of various pieces have been modified to allow them to move across boards (for example the Cannon must move three spaces in one direction, two in a perpendicular direction and one in the remaining perpendicular). This version was developed and produced in a plastic board game format by Mind Games Manufacturing Limited, a company incorporated in Ireland in 1992. Although about 2,000 copies were manufactured, the company closed after a year and a half. A variant possibly similar to Star Trek ‘s Tri-Dimensional Chess is seen in Legend of the Galactic Heroes, a Japanese science fiction novel. Another SF 3D chess game is Cheops or Pyramid chess, mentioned in the Dune novels of Frank Herbert, which has the object of simultaneously placing one’s opponent in checkmate and one’s own Queen at the apex of the pyramidal board. A highly specialized three-dimensional chess variant is Gary Gygax’s dragon chess. Millennium 3D Chess is a similar 3D chess variant which is also played on three standard 8 by 8 chess boards (3x8x8). Millennium 3D Chess rules were written with the objective of extending the traditional chess game into a multilevel environment without distorting the basic game. To this end, Millennium 3D Chess has not "created" new chess rules, but instead extended the traditional rules to allow for multiboard play. Other than the concept of moving between chess boards (levels), all traditional two (2D) chess rules apply. A free PDF copy of the rules can be downloaded from Millennium 3D Chess Rules. See more info at WikiPedia . . .